We’re excited to announce that the “Time as Your Ally” ad campaign we designed for our client Tempus Aircraft Sales and Service has won an American Graphic Design Award from GD USA Magazine! With the company’s name (Tempus is Latin for “time”) as the inspiration, the ad addressed the theme of time as it relates to private air travel. 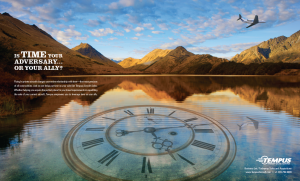 The ads appeared in aviation industry publications as well as trade show guides, all aimed at Tempus’s audience of business leaders, high net worth individuals and other VIPs.